I went into writing this article with wide eyes. “I’m going to find a handful of devs who have started (or propelled) their careers through social media.” And sure, social media has been a helpful part of many developers’ marketing strategies. But what I found wasn’t so straightforward as a list of developers with great origin stories. In fact, I found many who didn’t find social media all that useful at all. The insights provided by the devs I spoke with are even more interesting than what I originally hoped to find. I admit, I was left Googling at this point but tidbits from the ensuing discussion did help explain further. Gatekeeping is an educational model that controls the rate through which students move through their studies. It can involve a form of testing and/or proving yourself before moving on to more advanced levels. A gatekeeper then determines who advances and in the social media space this can be largely self-ascribed. There are some structured programs, however, that relate to social media competence. For instance, there’s the Inbound Marketing Certification from HubSpot (of which social media plays a large part). Putting yourself at the top of a pyramid means establishing yourself as an expert in your field, a go-to resource. We see this on social media every day. The self-ascribed “gurus.” But it trends across all industries and is often presented on social media most prominently. Making yourself an expert gives people a reason to seek out your services. Mark Simchock, Chief Alchemist at Alchemy United, thinks the whole gatekeeping idea is a bit dated. “For me it’s about curation — be it content, community and/or code,” he says and argues that gatekeeping is largely self-serving. “That’s not gonna last long in the 21st century,” Simchock says. And one could argue that’s why the most effective social media campaigns are also customer-focused. Instead of chest beating and pumping up your brand promotions all of the time, making posts and content that resonates with your followers can make a real difference in terms of engagement. All of this theory-based talk about how social media can be used does boil down to a few constants. One of them being authenticity, of which Becker says, “If you have to ask what it is, then you’re not it.” Being yourself online marks the difference between social accounts that just shout “Buy me” at its followers and those that behave and interact with followers human-to-human. For some, social media is more like a water cooler than anything else. “I think for those of us who work solo / from home, social media is a proxy for going to the office. It’s a water cooler. Would you ask, ‘Has anyone found success at the water cooler?’ Probably not, yes?,” says Simchock. Sarah DaSilva, owner of SuperPowered Web, has similar thoughts. Perri Collins, Chief Creative Officer of Collins Digital Media, says she’s connected with potential clients on social media but it’s not the only thing responsible for her success. However, it has made her more approachable, which certainly aids in the client acquisition process. Nick Leffler, freelancer and instructional designer, has definitely found success thanks to social media. As far as what types of posts and interactions garner the most response, he notes that “any [posts] that are personal,” tend to resonate the best. “Use it as a tool to talk to others, not just broadcast, and it will help you,” he adds. Leah Love-Orsbon, National Leasing and Marketing Director of Leasing Leah, LLC has probably realized the most success related directly to social media use out of everyone I talked to for this article. 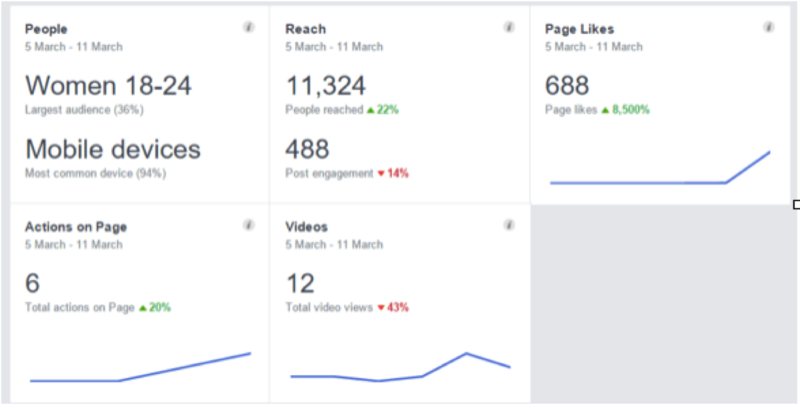 “I advertise on Facebook and I can’t imagine NOT paying for advertising,” she says, adding, “85% of our traffic comes from Facebook.” Because of that fact, she is always paying for Facebook ads. The great thing about that is the cost is relatively low. “This ad has been running for MONTHS and I’ve only spent $73,” Love-Osborn says. “I always tell people to (from a business prospective) not post something on Facebook without at least boosting it or advertising with it for $1. It allows you to track and it gets it in front of your audience – the people that like your page and their friends!” Love-Orsbon says. Video is very helpful for increasing engagement and interest as well. “We pay for Matterport videos to be made so we can post them all over social media,” she says. Photos are their second most popular type of post, so she recommends investing in high-quality photography to get the most impact. What do you think of this advice? How has social media helped your marketing strategy? Share your thoughts in the comments below!